This is currently really just a mock-up version and I will see what will be added when necessary to support my work on future projects. I came with the idea to create and compile Mad Pascal program with all editors in the same place. Mad Pascal and Mad Assembler are integrated in the program environment, but can be called from external destination if necessary. You can use the program freely and experiment as you like. It is archived in the file below. Just extract program files and folders to destination of your choice. Edited by Gury, Sat Nov 5, 2016 7:13 AM. your application looks very beautiful and user-friendly Keep up the good work and I hope you release it someday (or is it already somewhere?). 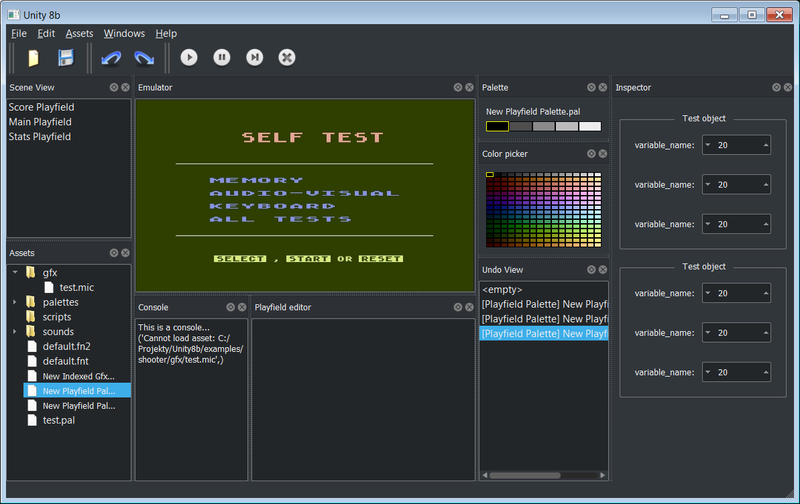 My goal is to make full-featured ide with as many functionality as possible to make Atari project development faster. But I have to make it bug-free and stable application. Of course, there are many special and magnificent tools already out there to help us. I am open for any sugestions and improvements. I also have to complete source code generators for other languages like Quick, CC65 and so on. Other people will have to come by to help me there for the examples and hints. it's great to see Atascii screen fans around Please check new version (attachment below) and see if it shows your screens, comments and feedback are all welcome. Basic generator? Will you support BASIC within the editor too? 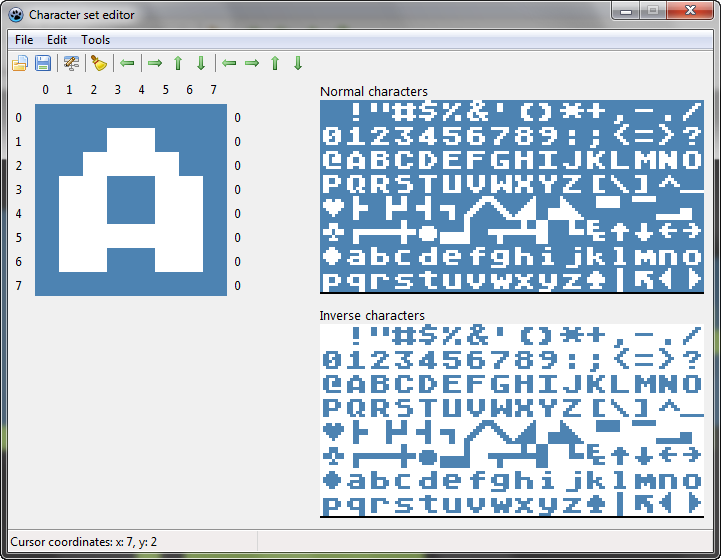 Could be handy for some optimisation of old BAS or TBA files to have an editor direct at PC not within ATARI Emulator. 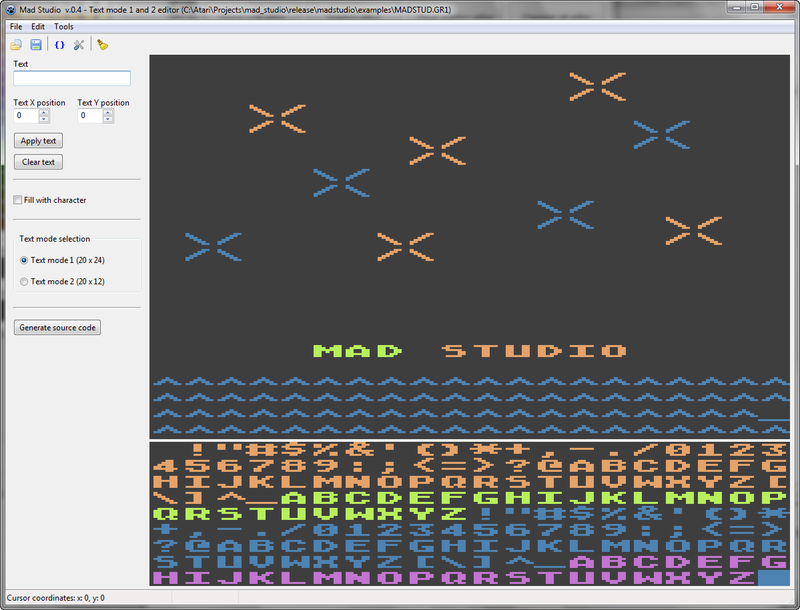 Could be handy for some optimisation of old BAS or TBA files to have an editor direct at PC not within ATARI Emulator. You supply your own code editor. I do have language def files for Notepad++, ConTEXT, and Crimson Editor, if anyone is interested. 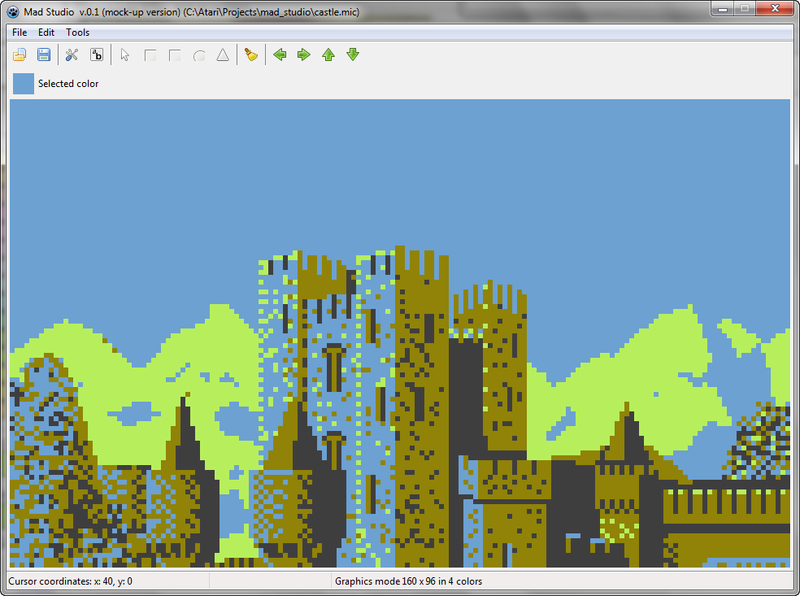 I encourage Gury though, since this will be Atari-specific. The basicParser would easily compliment here, and I suppose this to be what Gury has in mind. Edited by MrFish, Wed Nov 30, 2016 12:30 PM. Sure in the future. I had this kind of idea in mind to support underlying tools and cross-compilers. But for now, as for BASIC dialects goes, it is just a helper for generating source code from data from editors like pmg, graphics, font, atascii editor, etc. That's true, basicParser would be good candidate. Every such tool would be linked as external tool, or, with the permission of original author, as part of main ide. I still have to ask Tebe for Mad Pascal and Mad Assembler. Other tools include Effectus, Atalan, Action Compiler and so on. Is this Pascal only or does it work with 6502 assembly? Currently it compiles only Mad Pascal code, but assemblers like MADS, xasm and ATasm will be supported soon. Edited by Gury, Thu Dec 1, 2016 12:41 AM. 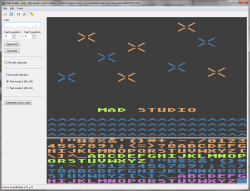 now Mad Studio also parses Atari BASIC and Turbo BASIC programs thanks to TurboBasic XL parser tool by Daniel Serpell, known also as dmsc. This tool, Mad Pascal and Mad Assembler by Tebe are integrated in ide, but they can also be called from another location on your device. Information about supporting and external programs can be found in Help menu / About in the main program window. There are also links referencing to sites of original authors of mentioned tools. 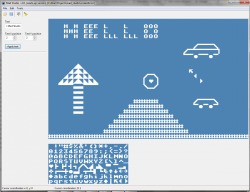 When BASIC program is parsed, it is ready to run on your favourite Atari emulator or real machine. One of the next versions will probably support automatic calling of BASIC programs from emulator. I forgot to mention. Using source code editor for BASIC programs, you have to provide Atari BASIC / Turbo BASIC XL code in listed format (normal ASCII format), or better yet, copy/paste listing code to editor directly (and saving to text file). Then, on parsing stage by default, tokenized version of BASIC program is ready for you. To open or save untokenized (listed) BASIC file from/to any device, it has to have different extension than .BAS. 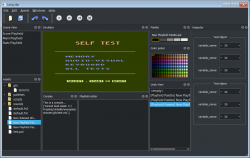 TurboBasic XL Parser Tool options can be changed directly in the program, with the exception of two options, -n nun to set the maximum line length and -o to set the output file name, which will be supported in next version. 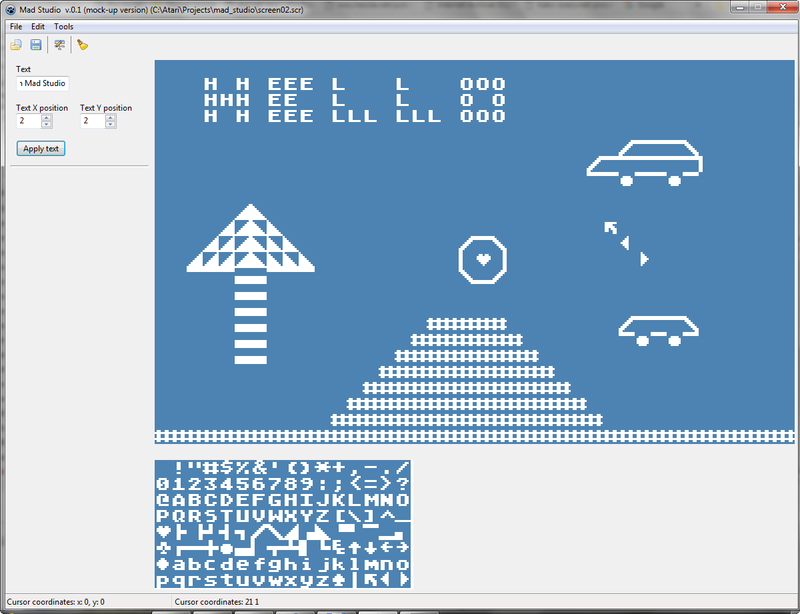 Also, with the help of TurboBasic XL Parser, you can code program in the way as referred here. 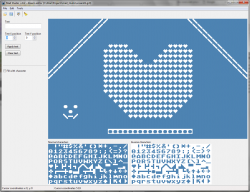 print "This is a heart: \00"
I like your studio also Atari Graphics Studio! Thank you for using it, Matej. Your name sounds like you come from country I am living. Yes but I am from Slovakia not Slovenia (you have sea and we have Danube, almost same flag and probably I will understand your language without learning). Was there strong ATARI scene in Slovenia? Also how many of Slovenian Atari sceners there are? ATARIs but still having turbo 2000 and tape player). Edited by Matej, Wed Dec 7, 2016 10:35 AM. Unfortunatelly there are not so many Atarians here, I know just two or three who used it and one who actually used it for programming in assembler and making Tetris game. But the Atari community is still pretty big all over the world. That is what it counts. I am glad my tool will be of some use for you. Many new features will be added, but in time. 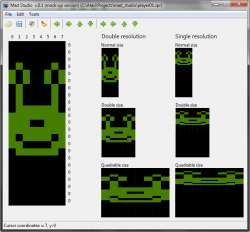 new version of Mad Studio (0.4) is ready to download. 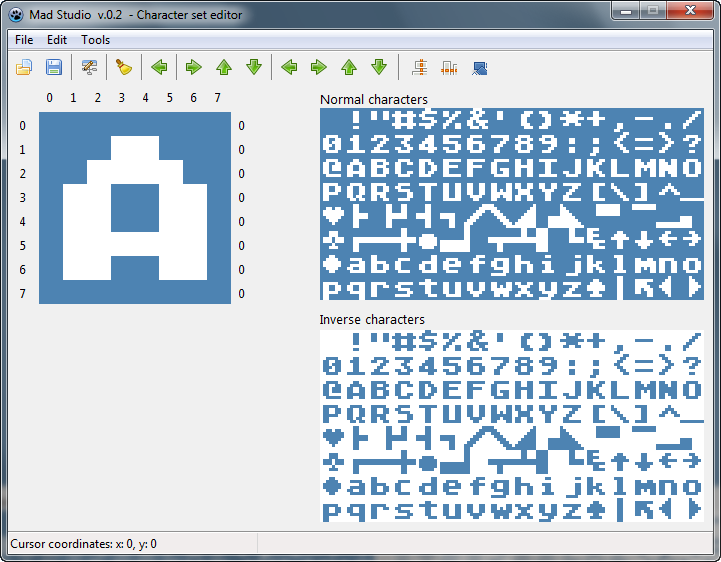 Text mode 1&2 editor has some problems with generated code for Atari BASIC, but I will fix it. 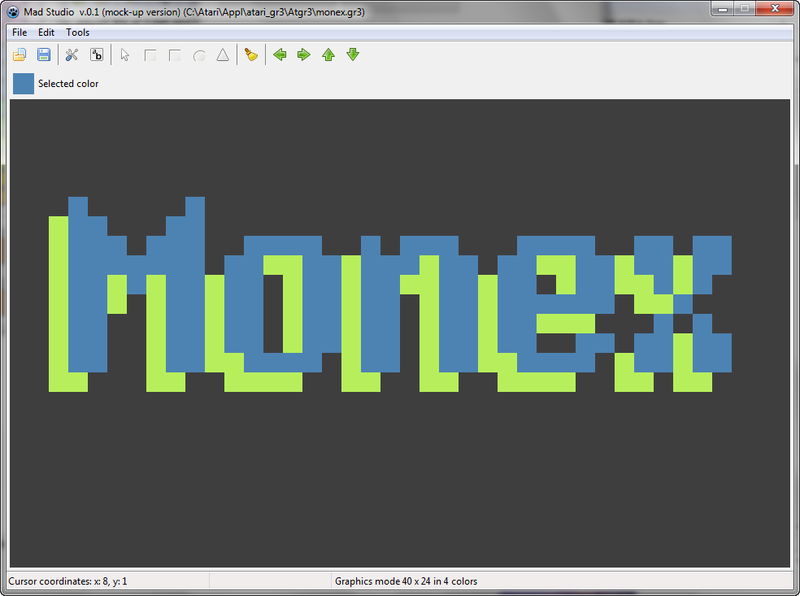 I also included COLOR3 register in color palette window to work with inverse lowercase letters in these text modes. Edited by Gury, Sun Jan 8, 2017 7:32 PM. 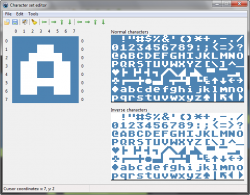 Atascii editor is fixed to 40x24 area. Can you explain me in what way did you want to resize the image? Clip particular part of the image and use selected area when saving and generating the code? Ok, I will think about the ways to expand an editor and when new functionality will be added, you can check and confirm if it is what you wished for. try this version and tell me me if this is what you were searching for. 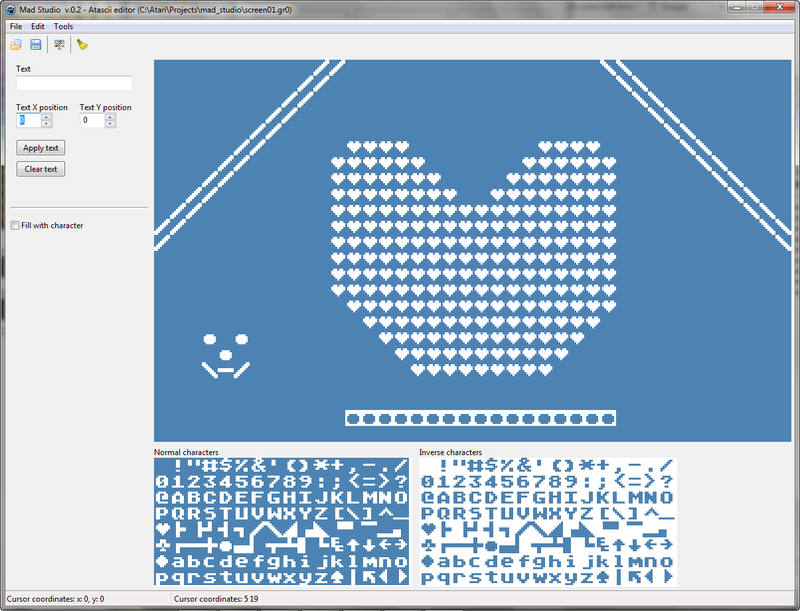 In Atascii editor at the bottom of the left side panel type the maximum X and Y coordinates to set new limits. 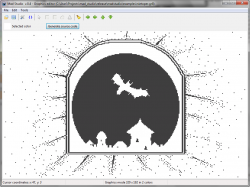 Then draw you artwork, save it and go to Source code generator to see prepared code listing. For testing purposed I just prepared code for Atari BASIC and TBXL. Listings for other languages will be added later. To determine which resolution did you choose for your artwork, I suggest naming files to corresponding resolution. 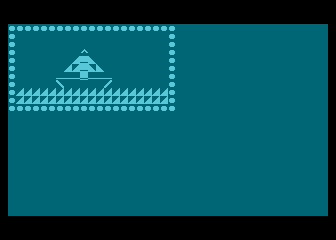 For example, for picture of dimensions 20x10 you could use name R20X10V1.GR0. Note that generated code puts the picture at the position 0,0. Maybe it would be good to change this parameters in next version, too. 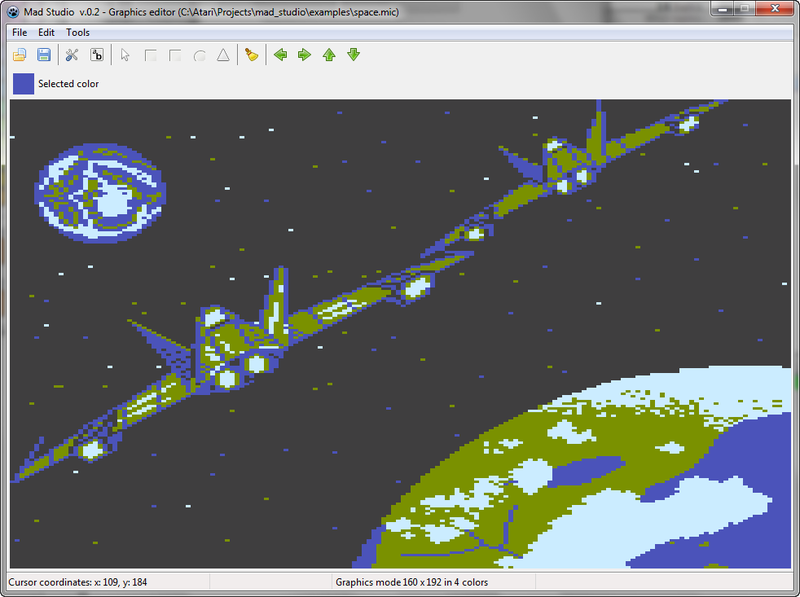 Here is an example of picture with dimensions 20x10 to test what is described in this post. Edited by Gury, Sat Jan 14, 2017 4:36 PM. Good to hear it is of some use. I will include the updates for this feature in next release. Good examples of Atari 5200 Pixel art? Best looking games? Is there any Atari 7800 Graphics tool out there?